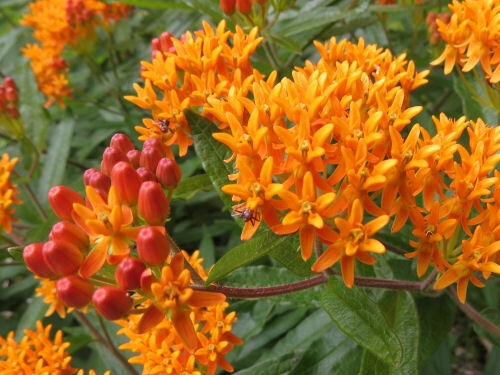 There are relatively few orange flowers that you will find in the wild, but even with narrowed choices, one of the most stunning is butterfly weed. 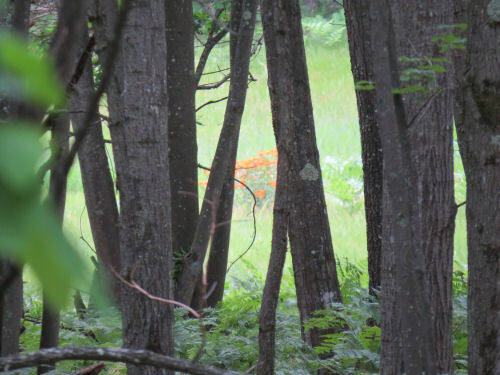 I spotted this clump from far away on my hike on Monday because it practically glowed, showing through the trees. 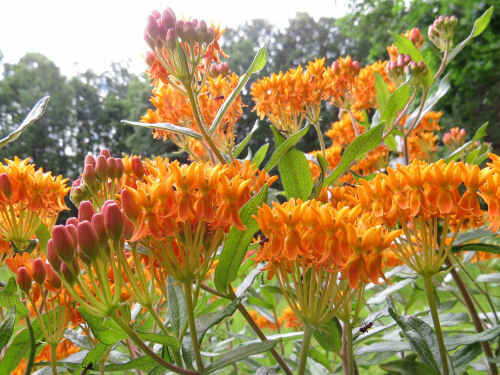 It's a milkweed, Asclepias tuberosa, and the shape of the flowers is a dead giveaway for any of the milkweeds. I'm just chilling, giving myself a good rest before my shift at work tonight. Hope you all have a good weekend. 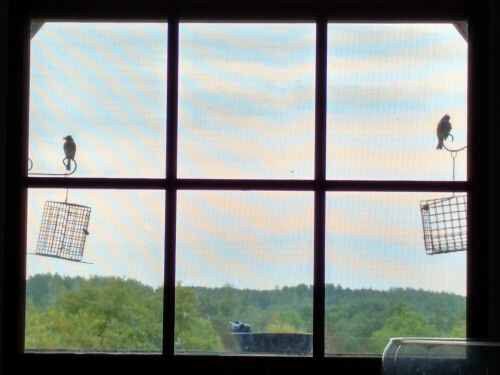 This has been the view out one of the windows to the deck quite regularly for the past two weeks. It's a pair of phoebes that have a nest somewhere out in the aspen grove. 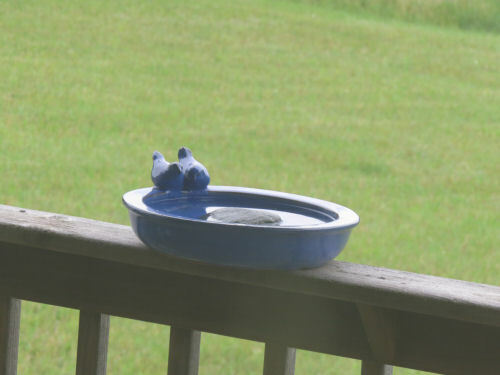 They come and sit on the empty birdfeeders like bookends around the unused bird bath. It's like a bad joke. 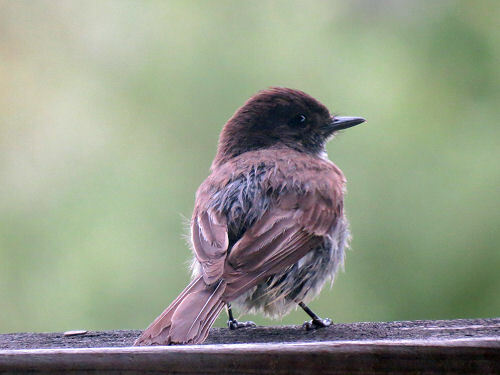 I've tried to get better pictures, but they are so nervous they won't come near the deck at all if I sit outside, and they don't sit still anywhere longer than a few seconds. This is the best I got, through a window. You can almost sense the wariness. Still, I'm glad to have their company. I added a rock to the center of the birdbath in case it was the smooth edges the birds don't like. Nothing doing. No feathered creature has been near it. I wonder if the ceramic birds on the rim scare them off. Look who's in one of the dead aspen branches. 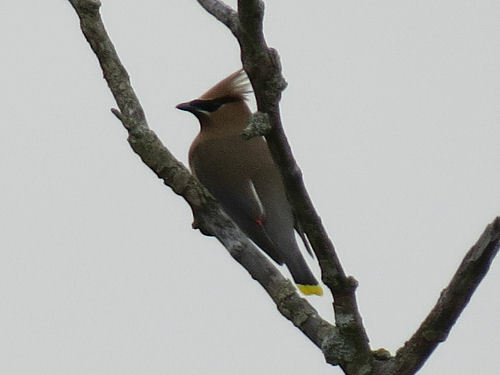 A cedar waxwing! They don't usually show up until the mulberries are ripe. 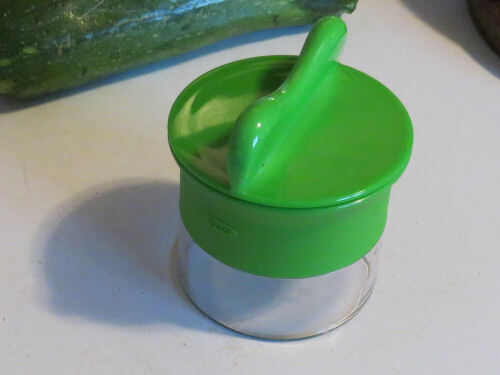 Given that I don't really like to cook and solidly claim that I've already cooked my lifetime quota of meals and am therefore DONE, I'm a total sucker for interesting kitchen gadgets. Like this one. Here's the actual clue, if you haven't seen one before. It's a spiral cutter. 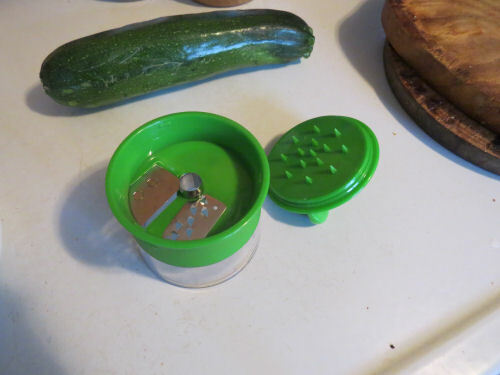 You can use it on any vegetable over about an inch in diameter. So far I've made cute carrot spirals on my salad, and tonight I did this with a zucchini. Pretty good. 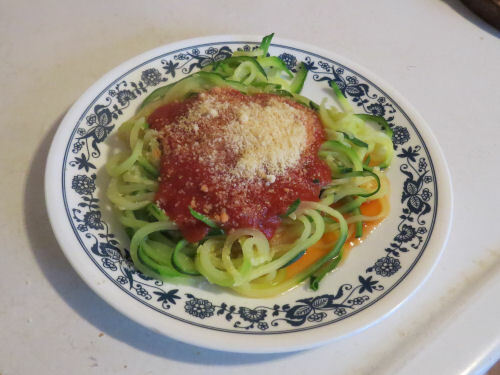 I boiled the zucchini spirals for a couple of minutes and added some sauce from a jar. Very like pasta texture but all veggies. I suppose you could do a fairly green banana or a hunk of melon. How about green melon spirals with blueberries and cherries. 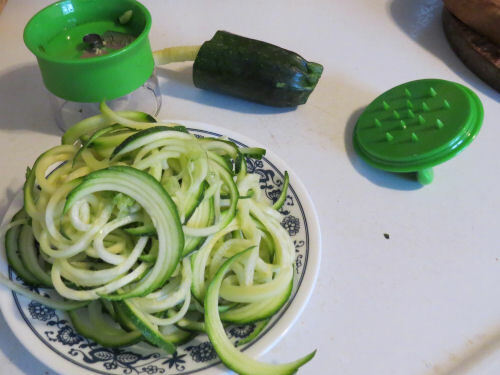 I think the cooked zucchini spirals would dehydrate well for backpacking. I particularly like that there is no electricity or battery power required, just a twist of the wrist. Fun! The last time I did something this stupid I had Maggie to tell you the story so I could spare myself the embarrassment. (See link at end). This time, I'll just have to 'fess up. I had planned on taking a walk of about two miles yesterday. Instead I made it something between five and six. 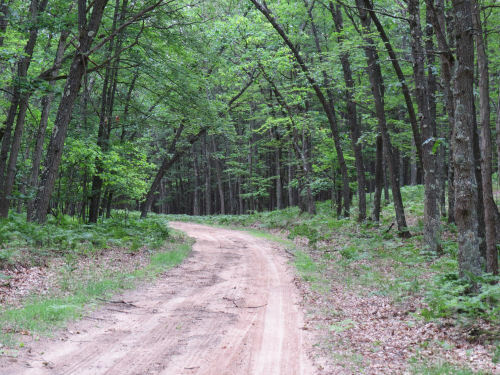 Let's start with the road that leads to the fire tower road. It's called Fox Trail. It's a real road, but is only a snowmobile trail in winter, and it's no joy to drive after a rain. There's no cell service out there at all. As far as I know, there isn't even a cabin in maybe ten square miles. 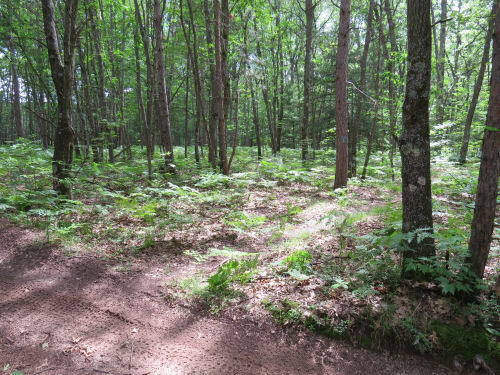 My plan was to park at the intersection, walk up the fire tower road, bushwhack across to the North Country Trail, hike south to Fox Trail and go back to the car. I've done it lots of times. But not lately. See where this is going? I knew I had to go back down the fire tower road a bit before cutting over to the NCT. What I had apparently forgotten was just how long "a bit" is. 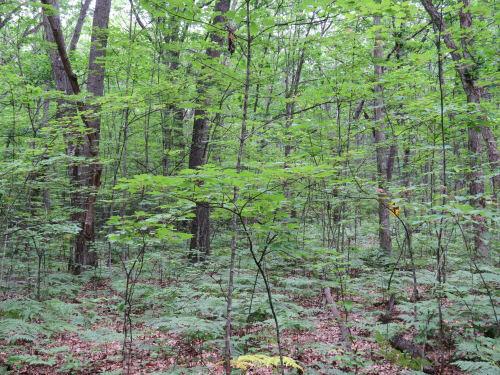 So I'm walking and walking through the woods and not finding the trail. Annoying, but not alarming. So after a while I pulled out my cell phone to see if there was enough signal to load Google Maps (the NCT maps require a real signal). My little half bar was just enough to show my blue dot way north approaching Centerline Road. Phooey. I had missed the trail completely. The afternoon was overcast and it was pretty much impossible to pinpoint the sun to get a direction. But I turned around and headed back south, not wanting to walk out to Centerline and around by roads. That was a longer walk than I was interested in. I had things to do. And I knew there was a motorcycle trail that cut across the NCT somewhere. What I didn't have was any kind of mental picture of that motor trail map in my head. So now, I'll show you my "after the fact" map. You can click it to make it bigger. The roads are white. The NCT is light blue. 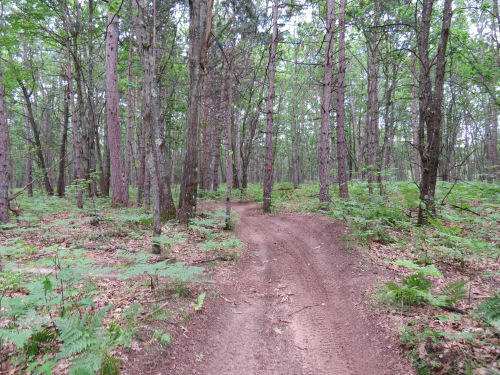 Solid red is the Big O Motorcycle Trail. FT is the fire tower. The dark blue dots are what I think I did. I left my car at the bottom of the fire tower road and walked up, came back down too short a way and ended up heading north instead of east. 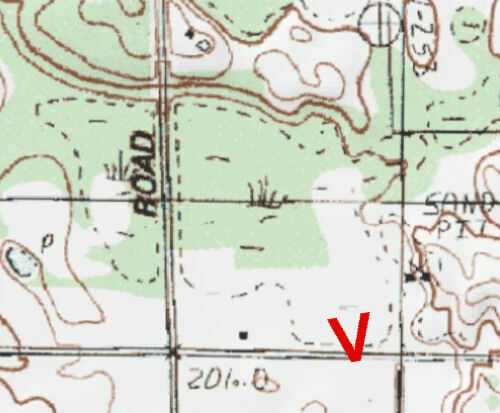 I knew for sure where the motor trail crosses Fox Trail(left side of map). What I thought the motor trail did is the red dashed line. If I'd really thought about it, I would have known that was wrong because it doesn't cross the fire tower road. Saying that after the fact is easy. But my plan at that point was to either hit the motor trail or the NCT. Next slide. Can you see the motor trail? Half hidden by the tree on the right is a crossroads sign. I was literally six paces from the trail and couldn't see it. Anyway, now I had found the motor trail. I thought I must have somehow crossed the NCT without seeing it at all. I was actually at point 1, but I thought I was at 2 because I had a wrong idea of the motor trail. So I turned right and walked a short way. No NCT. At this point, I realized how stupid the idea was that I had crossed the NCT and not known it. It's not wide, but it has a clear treadway and I was looking carefully. No cell signal of any kind to check my relative position. No sun. So I turned around and went the other way, but stayed on the Big O. I figured the worst that could happen was I'd come out to Fox Trail. 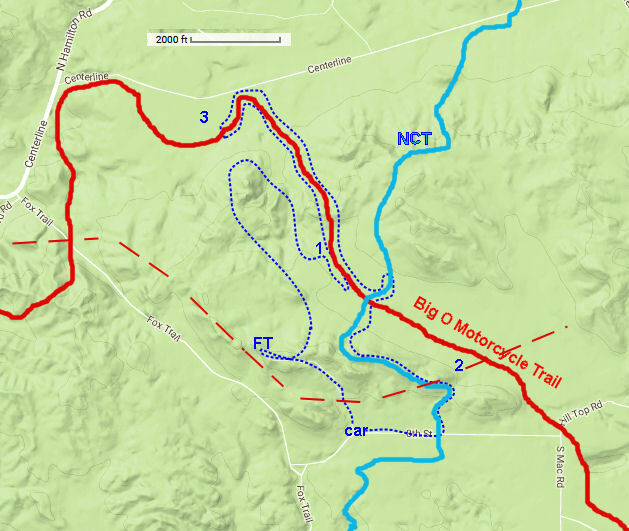 That's when it hit me, that I knew Big O didn't cross the fire tower road, and I had pretty much no idea what the motor trail did other than cross Fox Trail and the NCT somewhere. I'd now been wandering around for about an hour, probably over half of that time since leaving the fire tower site. Checked my cell, and had one bar. Good- I could get my position. Not good- to get a signal I had to be well away from where I wanted to be. Yup. I was clear up at point 3. You do understand that neither of those trails was on the map on my phone. That would have made it too easy. I layered those maps up for my own enlightenment after I got home. Turn around again. Walked past where I had found Big O. Walked past where I had turned around the first time. Not 100 yards farther, guess what. Found the North Country Trail. What? You don't see it? It's right there in the mid foreground, crossing Big O. Let me help you. Here's a view to the right down the NCT. But I turned left. 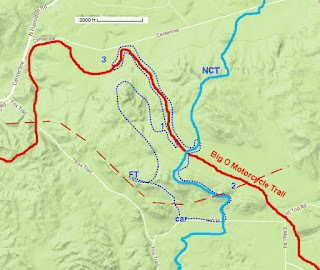 I just couldn't picture what Big O was doing, and although the red line looks like there are gentle curves, this is a motorcycle trail. It curves and twists and moguls all over the place. I was still semi-convinced I had previously crossed the NCT by accident. Well, it only took me about 100 feet of walking to realize I was going the wrong way yet again. The trail joined a two-track and I knew for sure that was way north of where I wanted to be. Turned around again. 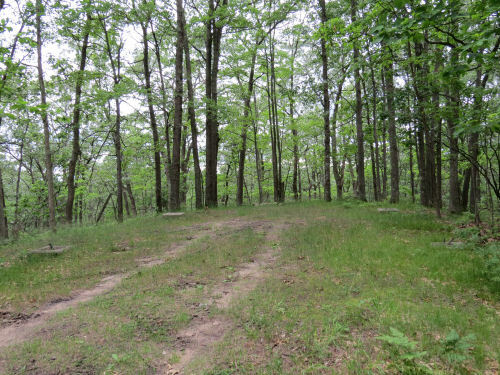 The trail quickly became familiar and I soon passed the spot where I should have found it on the original bushwhack from the fire tower. I know exactly what that place looks like. Now that I knew for sure where I was, all that was left was for me to be good and mad at myself for making such dumb errors. Oh, and to walk back to the car. 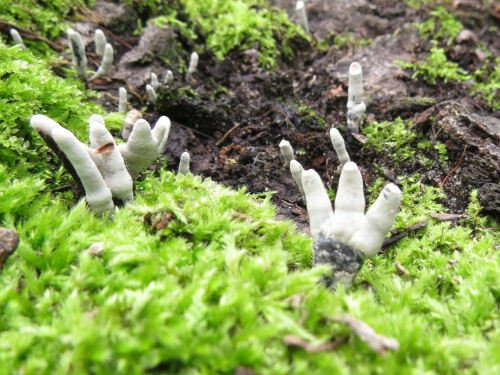 Found some cute little fingers of fungus like Mickey Mouse gloved hands waving at me. Or thumbing their noses. 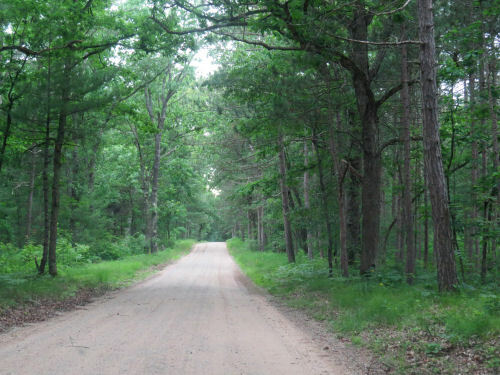 When I got back to Fox Trail, I could actually see my car, not a half mile back to the west. Was I ever really worried? Not really. It stays light till 10 pm at this time of year, and any direction of walking was going to take me to a road. Once I found the motor trail, I was golden. Just follow it and I'd come out somewhere. If I'd gone way east it would have been a longer walk, but do-able. Actual time of the whole adventure- a couple minutes shy of two hours, so I don't think I could have possibly walked more than 6 miles. I certainly wasn't going 3mph when I wasn't on any trail at all, and I fooled around up at the tower site for a few minutes. Anyway, I now have the Big O Trail firmly overlaid with my mental picture of the NCT. Permanently, I hope. You want to hear the final joke? This is the same place I did the similar stupid stunt before, only I was on the south side of Fox Trail that time. See Maggie Says "Pay Attention in the Woods"
I had to go to Irons to interview someone for my newspaper column. On the way home, about the closest place to take a little hike was to go up to the old Ward Hills fire tower. You can still drive up there, but it makes a nice walk if you don't. Here are the footings for the tower. It's easy to see three of them, but the fourth one is there. People now drive right up there and camp. It looks like the last time I blogged about it was in 2010, so it's time you saw it again! You would need a tower to get a view there any more. 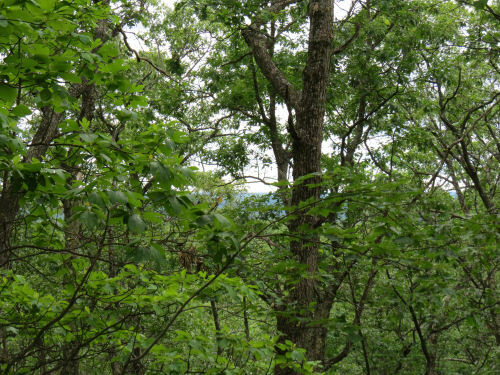 Although the site is a hill that drops away steeply on three sides (you can pretty much tell that in the above picture) and more gently on the road side, the trees have grown up all around. Here's the only bit of a view you have to the west now. You can just see some blue hills in the distance. 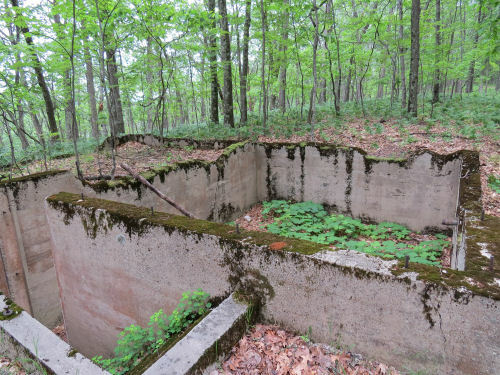 Actually, the most interesting thing is the foundation of the old tower keeper's house. I sure thought I had blogged about that before, but I can't find it, so you do get something new. It was small, but I always stand there and imagine what the house would have been like. I think it would have been a perfect place to live. 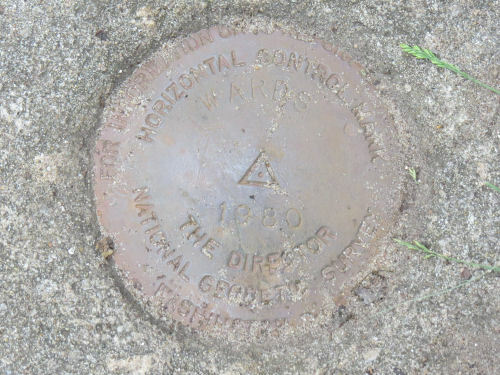 The other interesting feature is the benchmark from the 1980 Geodetic Survey. The temperatures were cool today, only in the high 50's. Hey, I like it. You'll get no complaints from me. I had a nice interview, an interesting walk, and learned several new things (the other adventures you may hear about). I wrote this month's newspaper column. I feel refreshed to face another work week. 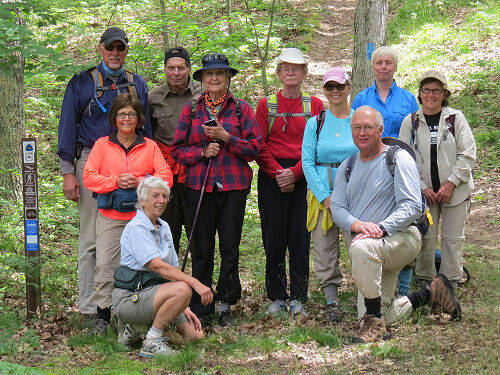 Today was the fifth hike in the series to walk the entire Manistee National Forest this season. Ten hikers this time. 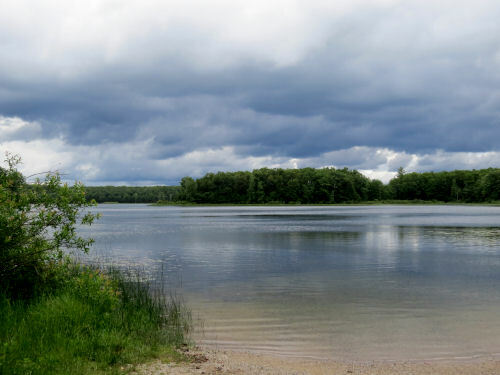 We started at Nichols Lake. The weather was absolutely perfect for hiking. Mid 60's temperature, mostly cloudy, but with some blue sky showing through. The mosquitoes weren't bad at all. 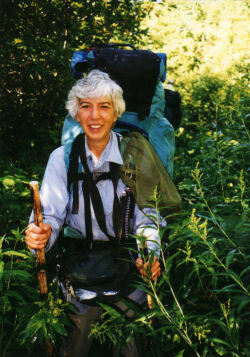 For the first few miles north of Nichols Lake the trail winds between a series of small lakes. 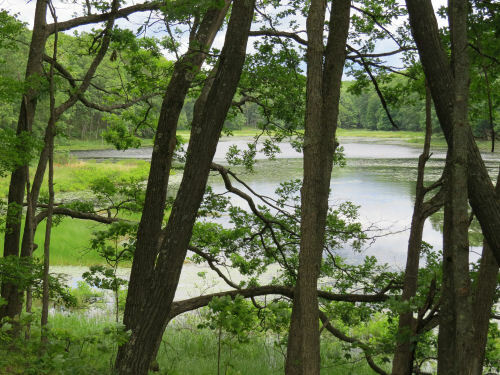 Leaf Lake is my favorite because it has so many little bays and wetland areas. Every bit of the hike today is included in what I backpacked, solo, last fall. But this time the travel was south to north, and of course this is summer. It looked so different! The first time I ever hiked this piece, it was winter. We have one sub-group that moves really fast down the trail. As I said last week, I'm happy enough to stay in the rear. Stopping to take pictures of the little joys I find is one of the best parts of hiking for me. 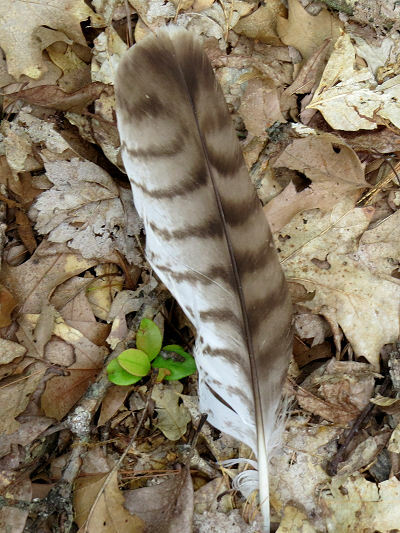 This week I found a hawk feather. I also heard a scarlet tanager, but couldn't find the bird to go with the song. Cedar Creek is always a favorite spot. It never seems to change the way it looks; the water level and color always seem about the same. 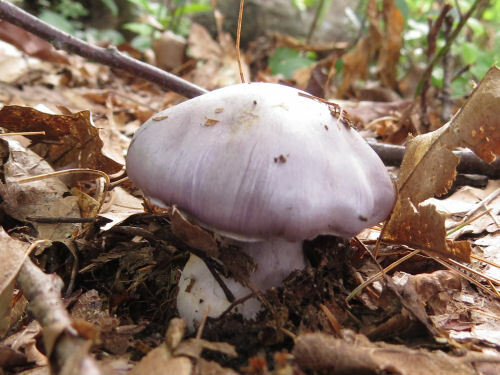 Here's one of the mysterious purple mushrooms. I'm pretty sure this is Blewit, but there was only the one, and I didn't want to pull it up to look at the gills. That doesn't kill the mushrooom (most of the organism is underground), but it would ruin it for other hikers to see. 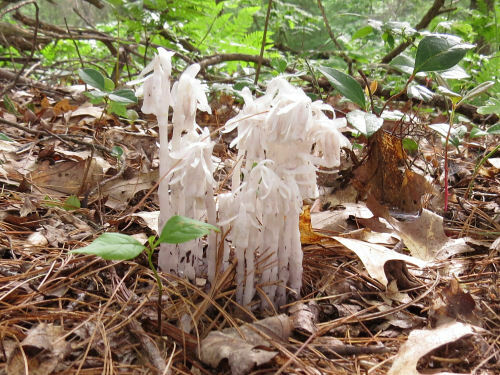 We've seen Indian Pipes on almost every one of these hikes, but most of the clumps haven't really been photo worthy. This one isn't bad. Eleven miles. The leaders did it in 3 hours and 25 minutes. I was sweep, bringing up the rear, and my time was 4 hours 15 minutes (inclusive of 3 rest stops). I don't know why I'm even telling you this. These hikes are not supposed to be races. We have several people who just want to do them fast, and they seem to be driving the group only because they don't like to wait for us to get to the cars at the end. Unfortunately, both of the vehicles at the end belonged to the "slower" hikers. At least the two people who like waiting the least got their car in place at the end, so they could leave as soon as they finished. Anyway, I did one of my favorite activities on the way home. Pick a dirt road going in the right direction and follow it till I have to take another. Made it to within 2 miles of my house by this method (not all dirt, but quite a lot) before having to get on the highway (river crossings on bridges are recommended in vehicles). Food, shower, jammies. A little rain outside to end the evening. A really nice day. The afternoon was absolutely beautiful! About 70 degrees, sunny with a breeze, blue sky and clouds. I slept as late as I wanted to today (12:30) then woke up slowly. Result: I did not feel awful. 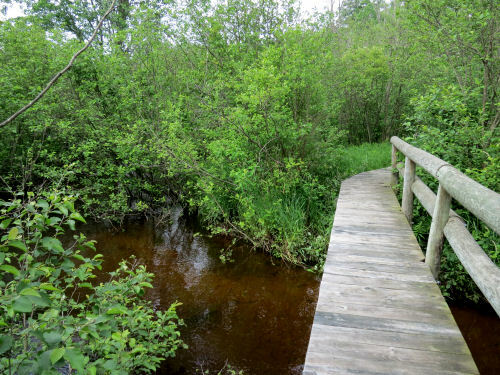 So I went for a walk- my standard road loop plus a little spur to check out the wetland on Johnson Road. It's pretty big- at least 5 acres. It looks like a meadow that you could just walk through, doesn't it? Not so. 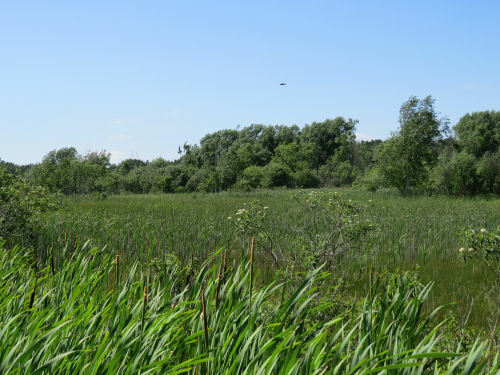 This is the same wetland, same view, I showed you in April. 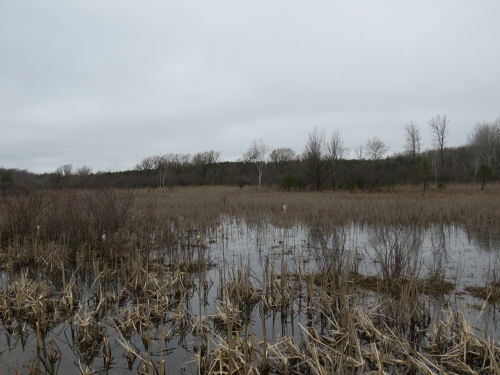 You can certainly tell in early spring that it has open water over much of the area. Here's the same view in March. Pretty much the same as April, but the sky looks more wintry. I'm liking this spot quite a bit. It adds about a half mile to my walk, so it makes a nice occasional diversion (and a small hill). 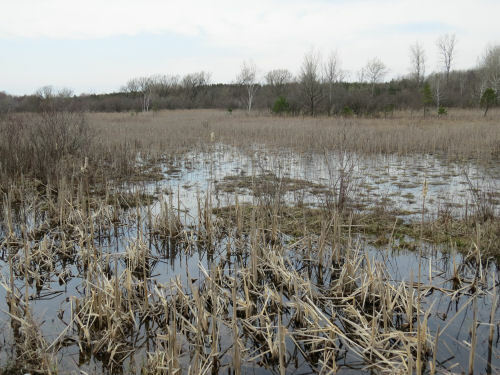 I also think it's interesting that there is no inlet or outlet from this wetland. (Note later- I found another basemap that shows an intermittent stream connecting to my cemetery creek. This makes more sense.) Perhaps I'll try to walk across it some winter when things are really frozen solid. The base of the "V" shows where I was standing and the direction of view for the picture. This is a case of me simply procrastinating about looking something up. These grow throughout our field. 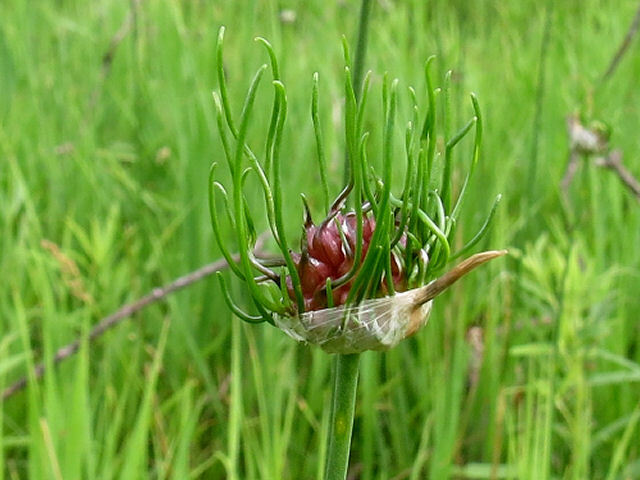 I've known it was one of the wild garlics (hey, it smells and tastes like garlic- I've even cut up some stems to cook with), but I didn't know which one. I could never seem to find it in flower. You'd think after ten years or so I might catch on. Anyway, this week I tried to look it up, even without a flower. Well, guess what! Although it's a flowering plant, it often has no flower at all, just those little green tails growing from the bulblets. So I'm not totally unobservant. It can have flowers, little white ones, but mine apparently don't like to expend that much energy. It propagates by dropping the bulblets. 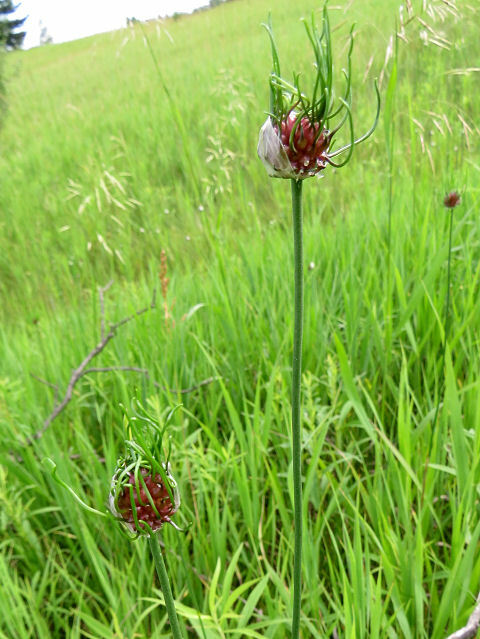 It's field garlic, Allium vineale. Here's the bad news. It's alien. Here's the really bad news. It's considered an invasive problem species because when livestock eat it, it taints the milk and meat with garlic flavor. Bummer. I had thought it was kinda cool-looking. Now I'll have to learn to not like it. I can keep on eating it, but I can't eat fast enough to get rid of it. Can Numitor Skip to Numenor?